The aim of this paper is double. Firstly, it contributes to identifying the specific role of national culture as a variable that helps explain the level of economic development and reinforces the effect of entrepreneurship on the income level. Secondly, a deeper understanding of these relations in the case of the European Union is sought. In this study, data from two different sources have been used. The Schwartz Value Survey measures seven cultural orientations that are then grouped into three bipolar dimensions (embeddedness vs. autonomy, hierarchy vs. egalitarianism and mastery vs. harmony). The Global Entrepreneurship Monitor provides information regarding entrepreneurial activity. Using linear regression analysis, cultural and entrepreneurial variables are able to classify countries according to their development level, explaining over 60 % of the variance in Gross Domestic Product per capita. The role of culture is complex, with geographical elements being significantly relevant. In the case of Europe, some common elements conform what could be called “a European culture”: autonomy and egalitarianism clearly predominate over embeddedness and hierarchy, while harmony tends to prevail over mastery. Nevertheless, four well-defined groups of countries within the European Union emerge. Central and Northern Europe is closer to this European stereotypical culture, while English-speaking countries, Eastern Europe and the Mediterranean area exhibit their own differentiating elements each. These differences also exist with regard to entrepreneurial activity (overall Total Entrepreneurial Activity, necessity and opportunity-driven activity). Each of the four regional entrepreneurial cultures is characterized by a different entrepreneurial dynamics that may be plausibly explained by culture and income. The authors are most grateful to the Editors and to three anonymous reviewers, whose comments and suggestions have contributed to improve the quality of this paper. Argentina (1993, 1995), Australia (1988, 1990, 1992, 1996, 1999), Austria (1996, 1998), Belgium (1991, 1995, 2002), Bolivia (1993), Bosnia-Herzegovina (2002), Brazil (1989, 1991, 1993, 1995), Canada (1992, 2001, 2002), Chile (1994, 1995, 1997, 1998), China (1988, 1989, 1995), Costa Rica (2002, 2003), Croatia (2002), Denmark (1991, 1995), Egypt (2004), Finland (1989, 1991–1993, 1995, 1997, 1998, 2001), France 1991, 1994–1996, 1998), Germany (1989–1991, 1994, 1996), Ghana (1995), Greece (1989, 1996), Hong Kong (1988, 1996, 2001), Hungary (1990, 1995), India (1991, 1992), Indonesia (1992, 1995), Iran (2000), Ireland (1995, 2000), Israel (1989, 1990, 1994, 1995, 1996), Italy (1989, 1991, 1997, 2002), Japan (1989, 1990), Jordan (2002), Latvia (1998), Malaysia (1989, 2003), Mexico (1990, 1996), Netherlands 1988, 1996, 1998), New Zealand (1988, 1994, 1998), Norway (1994), Peru (1996, 2002, 2003), Philippines (1996, 1997, 2000), Poland (1988, 1990, 1997, 2003), Portugal (1989, 1993), Romania (1996), Russia (1993, 1995, 1996, 1999, 2002), Singapore (1991, 1995, 1997), Slovenia (1992), South Africa (1992, 1994, 1996, 2003), South Korea (1993, 2002), Spain (1988, 1996, 2002), Sweden (1992–1994, 1998), Switzerland (1990, 1996), Taiwan (1988, 1993, 1994), Thailand (2005), Turkey (1990, 1993, 1995, 2000), Uganda (1995), United Kingdom (1990, 1995), USA (1988, 1989, 1991–1996, 2000), Venezuela (1989, 1991, 1993, 1994), Yemen (2003). Bosma, N., & Levie, J. (2010). Global Entrepreneurship Monitor: 2009 executive report. http://www.gemconsortium.org/. Accessed October 2011. Fernández-Serrano, J., & Romero, I. (2013). 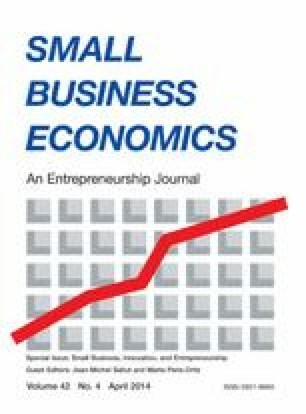 Entrepreneurial quality and regional development: Characterizing SME sectors in low income areas. Papers in Regional Science, 92(3), 495–513. doi: 10.1111/j.1435-5957.2012.00421.x.